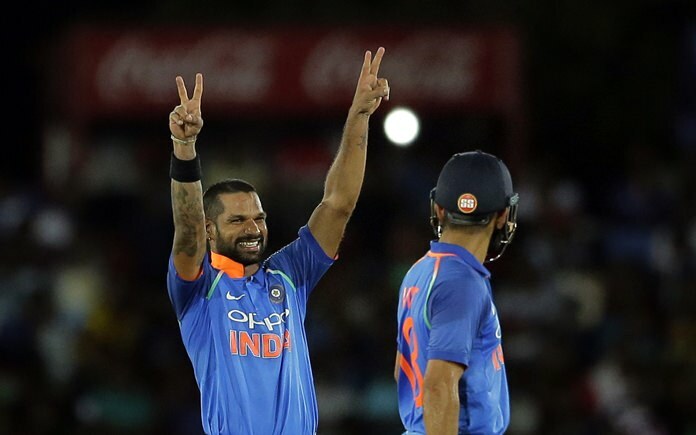 Dambulla, Sri Lanka (AP) — Shikhar Dhawan scored 132 not out and shared an unbroken 197-run partnership with captain Virat Kohli as India beat Sri Lanka by nine wickets with 21 overs to spare in their first one-day international on Sunday. Dhawan smashed 20 fours and three sixes in his 90-ball innings, which was his 11th ODI century. Kohli finished on 82 not out off 70 balls after earlier winning the toss and asking Sri Lanka to bat. The hosts failed to convert a good start into a big score and were dismissed for 216 in the 44th over. Niroshan Dickwella top scored with 64, and shared a 74-run opening wicket partnership with Danushka Gunathilaka (35) and 65 runs for the second wicket with Kusal Mendis (36). But Sri Lanka quickly slid from a solid 139-2 in the 25th over, losing their remaining eight wickets for 77 runs. Left arm spinner Axar Patel took 3-34 for India. Seamer Jasprit Bumrah and spinners Kedar Jadhav and Yuzvendra Chahal took two wickets each. India lost Rohit Sharma to a run out with the score on 23, bringing Dhawan and Kohli together until victory. The second of five ODIs is on Thursday at Pallekele.